Take Action Now: Stop Red Flag Gun Seizures! Oppose Gun Owners Database! Hands Off our AR15s! Donate Join Today! Stop Red Flag Gun Seizures! Home Latest News- All the Latest News - State Legislation - City & County Legislation - 2nd Amendment in the News Elections- 2018 Gun Rights Pre-Primary Candidate Survey Gun Owner Action Center- Action Center Home - Stop Red Flag Gun Seizures! - Oppose Gun Owners Database! - Hands OFF our AR15s! Wisconsin Gun Laws Contact Us About Us- About Us - Staff - Affiliations & Links Donate JOIN TODAY! New Face in the Fight for Gun Rights! On behalf of the board, I would like to introduce you to a new staff member with the Wisconsin Firearms Coalition! As you know, the gun rights battle in Madison has taken a dramatic turn for the worse over the last two years. Not only did they kill our Constitutional Carry bill after we had racked up an astounding 40+ cosponsors — the inaction from lawmakers in Madison has given birth to a huge push for gun control. 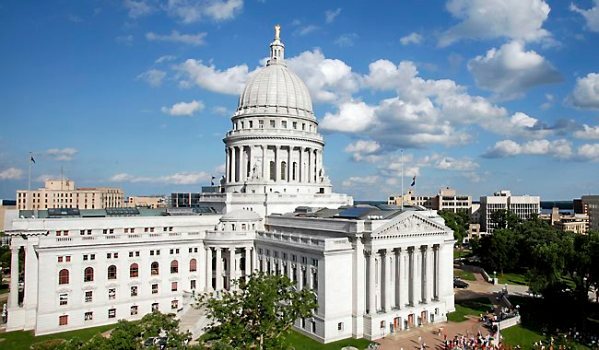 From establishing a statewide gun owner database, to reinstatement of the 48-hr waiting period to buy guns, to banning AR-15’s and similar firearms, gun grabbers in Madison are going for it all! As the fight for the Second Amendment here transitions from offense to defense, the Wisconsin Firearms Coalition is transitioning staff to meet this new threat. I’m happy to announce that Benjamin Dorr will be serving as our new Political Director! Ben has worked in the gun rights movement for several years now, on behalf of Minnesota Gun Rights, where they have been working to stave off an aggressive gun control push there, too. More, Ben has had experience in dealing with back-stabbing Republicans who say one thing and then do another once safely in office -– a growing problem here in Wisconsin. Greg Pruett, who has helped WIFC get established and begin to move the ball on Constitutional Carry, is moving back to his home state of Idaho to advance gun rights there and in other Western states! We want to wish Greg and his family the best in their future endeavors. With the legislature over for the year, Ben will be busy working on rolling out our candidate survey as well as meeting with candidates in person to figure out where they stand on the Second Amendment. Getting candidates on the record, for or against your gun rights, is crucial as we make plans on the upcoming mid-terms. I’ll be very blunt: insiders in Madison are telling us that the chances of the Senate flipping are dangerously high. The Senate currently has an 18-14 Republican lead, with one vacant seat that is a literal toss up at this point. Multiple people in the capitol are telling us they are concerned that Bloomberg-backed candidates may take up to six seats this fall -– and they only need five to take the majority! If that happens, everything is on the table. And it would be a major mistake to assume that the Assembly is going to hold the line. Already this session the Assembly took some steps against the Second Amendment, that didn’t become law. Now, in the ‘off season,’ Speaker Vos is openly talking about ramming through Universal Gun Registration law next session, the very bill being pushed by Michael Bloomberg! That’s why right now, with the legislature out of session, the Wisconsin Firearms Coalition is working overtime to build the largest grassroots fighting force possible! Nothing but overwhelming grassroots activism can stop a runaway gun control bill, if that’s what happens when the legislature reconvenes. First, becoming a member TODAY. A basic membership is just $35, less than $.10 per day! If you want to join at a higher level and receive a FREE T-Shirt that’s an option, too. Our T-shirts and membership cards ship out daily, so don’t wait! Second, if you are already a member, make a special contribution to help WIFC ramp up our social media and direct mail recruiting programs. It’s simple, we need to involve as many gun owners as we can and using social media and good old fashioned direct mail, we are going to do that. There’s much at stake when it comes to our gun rights here in Wisconsin. The clamor for gun control was at an all-time high last session, and that’s not going to change anytime soon. We need to be ready. Help us get there, by getting directly involved in this fight TODAY! Meantime, join me in welcoming Ben aboard! P.S. As the gun control battle in Wisconsin heats up, the Wisconsin Firearms Coalition is pleased to announce that Benjamin Dorr is joining our team! You can read more about Benjamin’s background and what our former Political Director, Greg Pruett, is up to in the email above. Meantime, we need your help to prepare for the elections and what could be a very dangerous next legislative session. If you’re not already a member: JOIN HERE! If you are a current member: Make a Special Contribution Here! Wisconsin Firearms Coalition is a non-profit advocacy organization registered with the Wisconsin Secretary of State. Contributions or gifts to WFC are not tax deductible for IRS purposes.